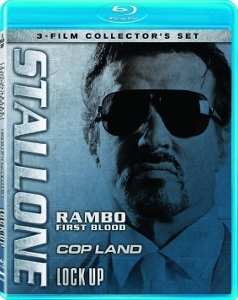 This article first published as Blu-ray Review: Stallone 3-Film Collector’s Set: First Blood – Cop Land – Lock Up on BlogCritics.org. New on Blu-ray is Lionsgate’s triple feature of Sylvester Stallone films. The three-disc set includes two of the action icon’s very best movies and one of his of his most forgettable. Billed incorrectly as Rambo: First Blood, 1982’s First Blood is where the legend of John Rambo began, cinematically that is. Adapted from David Morrell’s 1972 novel of the same name, the screenplay was passed around from studio to studio, with various actors attached at different times, for ten years. Stallone was in need of a non-Rocky hit, as the first two films in that franchise were his only big box-office successes at that time. 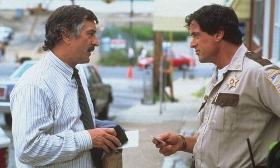 Stallone himself co-wrote the final version of the script, which was directed by Ted Kotcheff. For anyone only familiar with the Vietnam-infiltrating John Rambo of Rambo: First Blood Part II (1985) or the Afghanistan-based Rambo III, this much lower-key movie may surprise you. 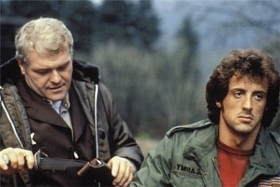 Rambo is a drifter who wanders into a Pacific Northwest town and quickly finds himself the victim of harassment by Sheriff Teasle (Brian Dennehy). After being hauled in on a vagrancy charge, Rambo assaults a number of police officers and escapes for the hills on a stolen motorcycle. Rambo’s Special Forces training (from his days in the Vietnam War) kicks into high gear as the film becomes a cat-and-mouse chase between he and the cops. Only Colonel Trautman (Richard Crenna), the man responsible for cultivating Rambo’s specialized skill set, has a chance to reach him before the cops find him and take him down. First Blood features a great, and somewhat underrated, performance from Stallone. The larger-than-life Rambo of the sequels makes it too easy to forget the subtlety of the original. The other highlight of this collection is writer-director James Mangold’s 1997 ensemble drama Cop Land. After a string of increasingly routine action blockbuster-wannabes, Stallone decided to tackle a more challenging role. He plays Freddy Heflin, the sheriff of Garrison, New Jersey, a small town inhabited almost exclusively by members of the NYPD. Freddy doesn’t have much to do, as the cop residents aren’t likely to cause too much trouble. This seems fine by Freddy, whose deaf ear kept him from becoming a full-fledged police officer. Things change when Officer Babitch (Michael Rapaport) fakes his own suicide after erroneously killing a car full of unarmed men. Lt. Ray Donlan (Harvey Keitel) is actually behind the cover-up and intends to kill Babitch to avoid any trouble for the officers in their town. Freddy manages to figure out what’s going on, as Babitch escaped Donlan and his henchmen and now desperately needs help. Stallone is excellent as a complacent law enforcement agent who must find the courage in himself to take a stand against Donlan. Mangold had a great cast to work with, including not only Stallone and Keitel, but supporting turns by Robert De Niro, Ray Liotta, and Robert Patrick. This is the director’s cut, which adds and expands a handful of scenes, changes the order of a few others, and has a significantly different ending. While the original theatrical cut it tighter and actually makes more sense, this version is still well worth watching. Lastly there’s 1989’s Lock Up, a strangely generic prison break B-movie made at a time when Stallone was having no problem finding work. Maybe after the disappointing domestic box office of Rambo III (1988) he wanted a smaller project to recuperate with. He was back later in ’89 with the hit Tango & Cash, leaving Lock Up to kind of fall through the cracks. 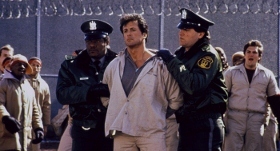 Stallone plays Frank Leone, a minimum-security prison inmate whose life changes for the worse after a vengeful warden transfers him to a maximum security prison. The warden is played sneeringly by Donald Sutherland. Frank must find a way to escape before the warden can frame him for the death of an inmate. It’s not a very interesting movie and Stallone doesn’t seem to invest much in the role. Lock Up feels like the kind of movie that would go straight to video, though it was released theatrically where it grossed only $22 million. At 115 minutes, it feels overlong as well, with a score by Bill Conti that fails to liven things up the way he did with his music for Rocky. Tom Sizemore co-stars as a prisoner named Dallas. This was only Sizemore’s second film role and he has a few funny moments. These three films have all been out on Blu-ray separately and the discs in this collection are identical to those. The earliest film in the collection, First Blood, is a nice visual upgrade from the old DVD. The black levels aren’t as deep as they could be, but other than that this is a really solid 1080p transfer. Sharpness and detail are strong even in the darkest scenes, like when Rambo is hiding out in an abandoned mine shaft with only a torch for lighting. Not surprisingly, the most recent film, Cop Land, looks the best. Close-ups reveal a lot of detail, especially in the weathered faces of the middle-aged cast members. Black levels are solid, but texture is visible even in the darker scenes. Lock Up is the surprise of these three. It looks really good considering its age, with realistic skin tones and a consistently sharp, clean image. Detail is a little lost during the darkest scenes, but overall there isn’t much to complain about here. Cop Land and Lock Up both have DTS-HD Master Audio 5.1 soundtracks, while First Blood has DTS-HD High Resolution soundtrack. First Blood doesn’t have the full range of a modern action movie, but its many explosions have pretty loud bass response. The surrounds are not used all that often, so the overall effect is not truly immersive. But for a 30-year-old movie, it sounds good. Again the most recent film sounds best, with Cop Land’s shoot-out scenes packing a lot of punch. An extended sequence near the end plays out as if heard through Freddy’s damaged ears, with a high pitched whine being the prominent sound. The viewer really is put in the place of someone with impaired hearing. Lock Up is underwhelming, with a thin-sounding mix that doesn’t have much bass presence. Dialogue is clear at least but there isn’t much usage of the rear speakers, except for a little bit of music and occasionally some crowd scenes with lots of noisy extras. Each disc contains a number of extra features, mostly carried over from previous DVD releases, even though they aren’t listed on the case. First Blood has two excellent commentary tracks, one by Stallone and one by David Morrell. Since he wrote the original novel but wasn’t really involved in the making of the film, Morrell has a unique perspective and is very interesting to listen to. “Drawing First Blood” is an informative 22 minute featurette on the making of the film. There are also a few minutes of deleted scenes, including a much talked about alternate ending. Only on Blu-ray is a trivia track that runs throughout the movie. Another very good commentary track shows up on Cop Land, with director James Mangold, producer Kathy Konrad, and actors Stallone and Robert Patrick. They were all together for the track and shed a lot of light on the creation of the film and the differences between the theatrical and director’s cuts. Deleted scenes, a short making-of featurette, and a storyboard comparison round out the features. Lock Up has the least to offer, but there are three featurettes (all under 10 minutes) that are mainly promotional pieces and an interview gallery. The most interesting information is about how the filmmakers shot in a real prison and used real prisoners as extras. There is some candid footage of co-star John Amos signing autographs for the inmates and a snippet of Stallone choreographing an outdoor fight scene. Think of Lock Up as a bonus to go along with two great movies. Stallone 3-Film Collector’s Set: First Blood – Cop Land – Lock Up is a real value for fans that haven’t already picked up these films.